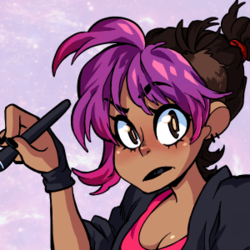 Star is a Bahamian illustrator and concept designer. Known for being a bit of an art mercenary she has worked for the Game Grumps, Jessica Nigri, Super Best Friends Play and Arcadea. She is currently the concept designer on Ross O'Donovan's show Gameoverse and also has her own webcomic Welcome Mats. She would like everyone to know that her name is a reference to Blue Exorcist and D.Grayman and not Twin Star Exorcists.